The novel ties you down to finish reading it, but there is also the urge not reach the end because you sense that it will be a very bad ending. The main figure is never able to tell the truth as it is or to confront it but tries to mend the past wrongdoings by being charitable as money would solve everything. He remains deeply selfish never really thinking what his role was and that his present good intentions may leed to even worse. He remains undecided to the end even if he made up his mind, just thinking he might suffer he changes his intentions. The Judas tree is a story of a treason, the main character is David Moray, a doctor who lost his parents in his late childhood and since then he thinks that because of his sufferings he is entitled to better. At the beginning of novel we meet Moray as a successful, rich chemist owner of an enterprise living in his new lavish palace home in Switzerland. Acting as an omen, the treasure of his garden is a Judas tree. Soon his happy time in Switzerland is overshadowed by the rememberance of his past treason of his youth times. As a young doctor he fell in love with Mary the daughter of a baker. Mary was the fiance of Walter Stoddart, a local rich man's son. But the love between Moray and Mary grew stronger, Mary broke up with the insensitive Walter against the wish of his family and became the fiance of Moray. Everything looked bright, Moray soon secured a position as a doctor at hospital but he got sick with his lungs and in order to recover due to the chance of a better weather had to embark as a naval doctor on a ship heading to India. During his trip he was exchanging letters with Mary and with her brother, his good friend. But soon he grew fond of Doris Holbrook who is travelling with his rich parents involved in medicine business. The parents saw him as a potential husband for Doris proposing him a good position in the company. He saw this as a good opportunity for richness thinking the misfortunes of his childhood would be repaid. Dear reader I stop here narrating, if the description caught your curiosity take up the novel. Judas Tree at Amazon. 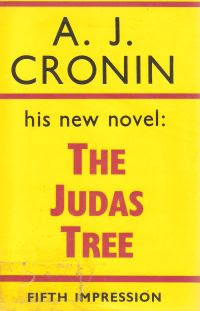 Delighted to see this and your other Cronin blogs! The Judas Tree is an excellent novel and it's particularly interesting - and heartbreaking - to see how life changes for David Moray as he makes a series of bad decisions.